Justice hits its mark! Based on the DC Comics series, Arrow reinvents the edgy and iconic character for today's audiences in the year's most thrill-packed and visually stunning action series. After being marooned for five years on a remote island, billionaire Oliver Queen comes home with a mysterious agenda and lethal new skills to fight crime in Starling City. Wearing the dark hood of a "vigilante" archer, Oliver is fiercely determined to right the wrongs of his father and thwart those who have corrupted his city! When it was first announced, Arrow seemed like a stupid idea. The CW had just finished up its long, successful run with Smallville, a show that had limped by on its last few seasons thanks to the introduction of Green Arrow. Now they were going to do a series focussing on GA, but it wasn't a spinoff and he wasn't going to be played by the same guy? Imagine if the upcoming Better Call Saul was still about a shady criminal lawyer, but it didn't star Bob Odenkirk and the entire series was based in Hobart, Indiana; Breaking Bad fans would riot. But the show turned out to be pretty good. It was dark and moody, and didn't shy away from the fact that its hero was primarily using a weapon designed specifically to kill. The opening scenes hinted at how deep the series was going to go, and the acting and action were both really promising. Everybody who stuck around was treated to a show that more than lived up to expectations. "The Vigilante" (as the show calls him) is played by Stephen Amell, a generically handsome actor who'd played a series of generically handsome guys in minor roles on a lot of shows before landing this starring role. The sculpt is by Gentle Giant, which probably means it was based on a RealScan of Amell's face; the likeness is decent (easily as good as any of Mattel's Movie Masters), but is overall generally "soft." It's mostly the costuming and paint that sells who this is supposed to be. 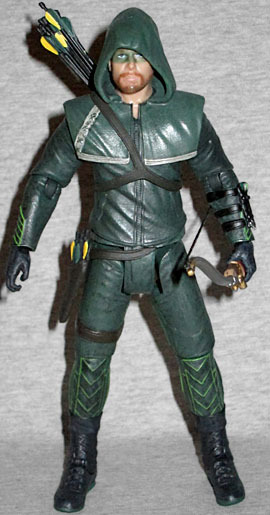 Ollie's costume is basically a set of biker leathers dyed green, and the sculpt of the toy gives the appropriate feeling of weight thanks to is wide, thick wrinkles. All the wrinkles point toward his right shoulder, just like they would if he were reaching for an arrow in his quiver. Go ahead, try it yourself: look down at your chest, and raise your right arm; watch how the wrinkles on your shirt change. 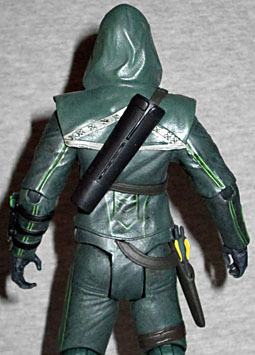 Anyway, Ollie's wearing combat boots, green pants with angle designs on the shins, a small quiver of arrows on his right thigh, a green jacket with a shawl and hood, black gloves, and a quiver on his back. This figure represents the time before Barry Allen designed him a mask, so he just has green paint smeared over his eyes. 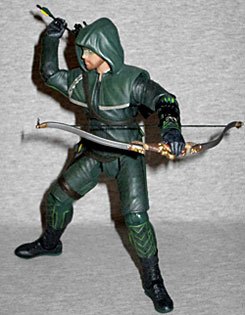 The figure comes with his bow and several arrows: two separate ones, and eight molded as a solid bundle to help fill up the quiver. The bow is the Season 1 model, which was a custom-built recurve bow with a bunch of extraneous hardware bolted onto it, and intricate carvings on the wooden body. This accessory matches all the details, but like the facial sculpt, it's soft. The string is elastic, and the arrows are the right length for Ollie's arms - but on that note, what's the deal with the short ones on his hip? His articulation is pretty good. He has a balljointed head and chest (acting as a waist), swivel boots, and swivel/hinge combinations at the shoulders, elbows, wrists, hips, knees and ankles. Most of the joints are a little stiff, but none of them broke before moving. The hips are rather poorly designed - we've seen H-joints like this on hips before, and even Mattel could make them work, but here the top of the hips bump into the waist and don't want to move forward. To raise the leg, you have to swing it out to the side, twist it up, and then move it back in. That's needlessly complex. His arms don't move well enough for a proper archery pose, but then again, it's possible that doesn't matter. Give yourself a hypothetical time machine: how far into the past would you have to go before you could meet with your younger self, and blow your own mind with the news that we not only have a live-action Deathstroke, but he's a truly frightening badass? Ten years? Five? Maybe just two and a half, to the day when you walked out of the Green Lantern movie, disappointed and convinced that DC would never make anything good again? Well, whenever, it's true; not that it has anything to do with this figure. Remember what we said earlier: this set is based on Season 1. And while Season 1 did in fact feature a guy in a black and orange mask, it also featured Slade Wilson. When Ollie found a similar mask in Slade's footlocker, he accused the soldier of being the one who tortured him; but Wilson pointed out that he and his teammate both wore that kind of mask; his teammate Wintergreen (for those who don't know, in the comics Wintergreen was basically the Alfred to Deathstroke's Batman). 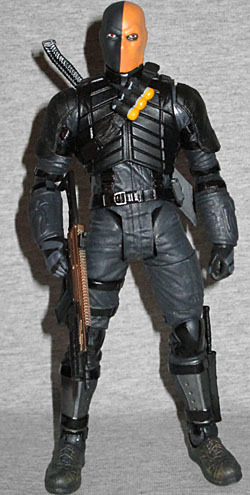 Now, it's possible that Wintergreen was also using the codename "Deathstroke," but no matter what, this figure doesn't depict Slade Wilson. For one thing, he's got two eyes! When you think "Deathstroke," you think "cyclops." The mask is divided perfectly down the center, and that even continues down his neck. Below the neck, whoever-this-is is wearing a really neat tactical battle uniform. He's got a fancy armored vest, shoulder pads, bracers, gloves, kneepads, and shin guards, all worn over a simple black jumpsuit - no one ever said this was going to be a bright, colorful figure. Come to think of it, what's the point of wearing a half-orange mask anyway? It's not very stealthy, no matter what continuity you're in. He has army boots, a knife sheath strapped to his left shin, a holster on his right thigh, and a scabbard strapped to his back, with three yellow grenades hanging against his chest. This is exactly what he wore on the show, so good work, Gentle Giant! 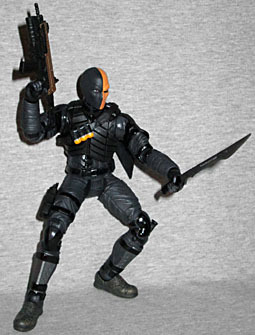 "Deathstroke" comes with a slew of accessories: a sword, a knife, a Desert Eagle pistol, and an FN SCAR rifle with an underslung grenade launcher. 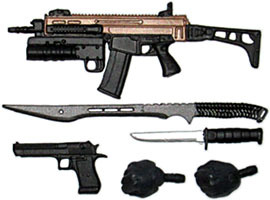 Everything except the rifle can be stored on the figure when he's not holding it. The set also includes two closed fists, and though they're packaged next to Deathstroke in the tray (and fit in his wrists), they're the same style of glove Green Arrow wears, so they're probably meant for him. Not-Slade's articulation is as good as Ollie's. He has a balljointed head and chest, swivel/hinge shoulders, elbows and wrists, H-hips, swivel thighs and biceps, double-hinged knees, and swivel/hinge ankles. The things we said previously remain true here, as well: the joints are stiff at first, but nothing broke, and the legs have trouble raising directly forward, but you can pose your way around it. Still, for a DC Direct product, this is great. Arrow is the best superhero show on TV right now. That may sound like damning with faint praise, but when your competition is Agents of SHIELD, it's nothing to shake a stick at. The show is better than it has any right to be, and if DC's smart, they'll tie it into their burgeoning movie universe (which would be a lot less clunky than trying to shoehorn the entire JLA into the second Superman movie, which seems to be their current plan). 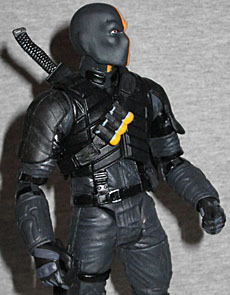 But even if you don't like the show, this is a good Green Arrow toy, and a good Deathstroke toy, and that can be enough.